The first day we arrived in London, the weather was foggy with a light drizzle. The weather report said that the clouds would break, so we were thrilled to wake on our second day in London to blue skies to ride The London Eye with kids. The warm sunshine was a welcome backdrop for sweeping views of London, and a British history lesson along the banks of The River Thames on the London Eye River Cruise. So what is it like riding The London Eye? In one word. Spectacular. You can see the whole city of London from 135 metres, the wheel’s highest point, (which the London Eye website says is the equivalent of 64 red telephone boxes stacked on top of each other). The ride takes about 30 minutes to complete the circle, giving you ample time to snap photos and take in the gorgeous views of London from above. Each capsule is completely enclosed, with 360 degree views, are heated and have bench seating for those uneasy with heights. Did you know the London Eye has 32 capsules, each representing a London borough? Hip Tip: Reserve tickets in advance and buy Flexi Standard Tickets or priority tickets to avoid the long queue with kids. The average wait time can be between 30 minutes to one hour, so this small step helps you spend more time sightseeing, and less time in line. The Flexi tickets cost £31.75 for adults and children 4-18, and kids under 4 are free. I know, this can really add up for a family of four, but definitely worth it if you are trying to decide where to spend your sightseeing dollars. One thing we learned is that everything in London is expensive, especially with current exchange rates. 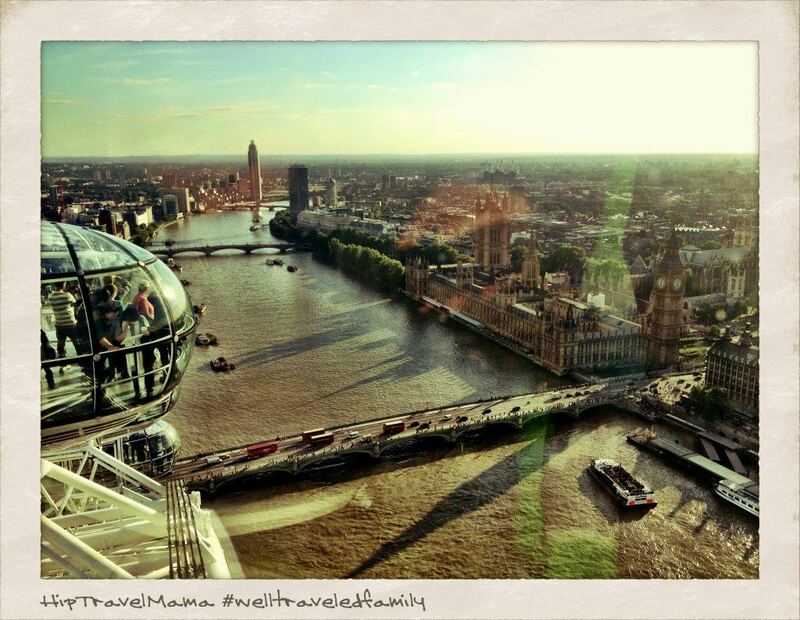 Not sure what London Eye tickets are right for your family? The London Eye has a very helpful London Eye ticket buying guide. Disclosure: We were provided complimentary tickets to experience The London Eye and The London Eye River Cruise. We were not required to write about our experience, or express any opinions about our visit. As always, opinions expressed here are our own. Inside one of the London Eye capsules, the kids explore the touchpad informational guide, giving them a quick, interactive primer on the London landscape below. Beyond taking a ride high above the city for spectacular views, The London Eye also has fun seasonal experiences for families year round. For example, if you are planning to visit London during the holidays, you can “EyeSkate” on The London Eye ice rink with the spectacular wheel lit in the background. EyeSkating opens November 7, 2013 and runs until January 5, 2014. Check The London Eye website for full details. Did you know that the London Eye also has a guided London river cruise? This 4o minute guided tour down the River Thames was a great way to sit for a bit and see London from yet another perspective. You will get a closer look at Big Ben and the Houses of Parliament, St. Paul’s Cathedral, Tower Bridge and the Tower of London from the water. There is so much history along the banks of the Thames and this open air boat allow us to get a closer look at the historical significance of the many buildings and bridges of London along the river. For the most savings, consider booking your London Eye and river cruise tickets together. What London landmark are you most excited to share with your kids? Leave us a note and join us in raising a #welltraveledfamily.